It is abundantly clear to us at House of Prayer, that the church is called to care for the community and its people. At House of Prayer, we are here to do that. We don’t have a ton of resources, but we will journey with you. We offer a free meal and a time of fellowship every Tuesday from 5:30pm to 6:30pm. It’s called Manna. This is a great time to come if you have any particular need. In addition to the food, there are a number of people present to listen to you, pray with you, or bear with you in your need. In addition, we have a food pantry that’s open by appointement every Wednesday. 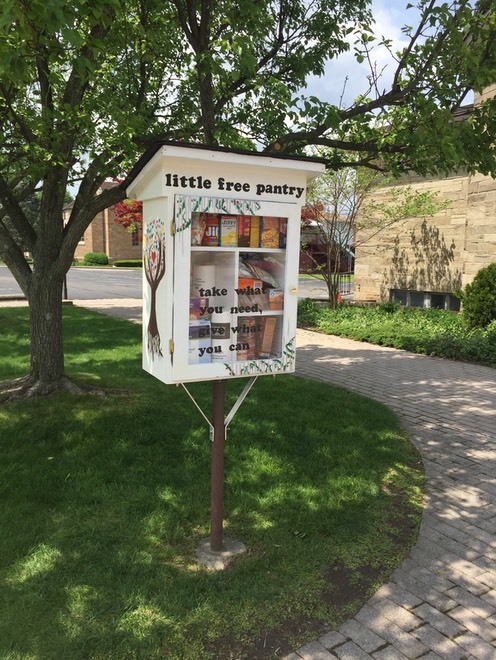 We have a Little Free Pantry in our courtyard that is available and accessible 24 hours a day, 7 days a week. Stocked by the community as they can, non-perishable food items, as well as personal care and some household goods, may be available at any given time and used by the community as needed. We offer clothes every Second Saturday of the month. We have a group of people with the gifts of home repairs and other work, who can be available to help you with problems around your house. Please feel free to use the form below or the contact information from our CONTACT page.